Ding Dong, the Ex-Im Bank Is Dead! It's gone where the goblins go, below. It seems like the liberty movement has taken a bit of a beating lately, with the Supreme Court defending ObamaCare subsidies, the FCC expanding its regulation of the internet, and budgets continuing to spend beyond our means and rack up more national debt. But it’s not all bad news, and at times like this it’s more important than ever to celebrate victories where we can find them. 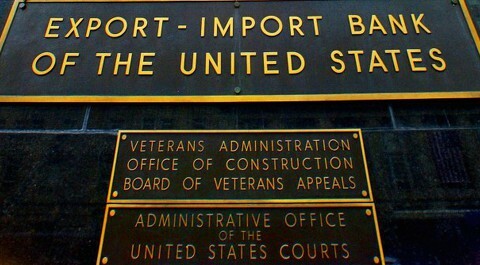 The end of the United States Export-Import Bank is one such victory. At midnight tonight, the Bank’s charter will expire for the first time since its creation 80 years ago. This means it won’t be issuing taxpayer-backed loans to big companies with political clout. It won’t be granting special favors to green energy companies to satisfy the president’s personal preferences. It won’t be handing out your money to foreign and corrupt corporations. The expiration of Ex-Im is a blow against the cronyism and corporate favoritism that gives “pro-business” Republicans a bad name, and that’s something we should celebrate. Sure, the Bank is a relatively small example of a larger, systemic problem with the relationship between government and business. With an estimated cost of $2 billion over ten years, there are certainly bigger fish to fry in the war against cronyism. It’s also true that Congress will very likely reauthorize the Ex-Im Bank sooner or later. But we should underestimate the impact of finally putting the brakes on a program that has overstayed its welcome by nearly a century. Stopping the Ex-Im Bank was only possible because ordinary people stood up and refused to take it anymore. The lobbying pressures, not only from the direct beneficiaries of the Bank like Boeing and General Electric, but also from big-money powerhouses like the U.S. Chamber of Commerce, was enormous. Overcoming that kind of inertia is no mean feat, and anyone who took the time to call or email their congressman should be proud of the role they played in helping David defeat Goliath. The Ex-Im Bank will expire, and the world will not end. Boeing’s planes will not fall from the sky, and General Electric will not close its doors. We are teaching the world a lesson that government handouts are not the way to prosperity, and that cutting useless programs will not mean an end to our way of life. In a time when the policies of reckless government spending and economic intervention have plunged Greece into financial chaos, it’s a lesson the world very much needs. Yes, the Bank will probably be reauthorized, but the next time we have this fight, our position will be all the stronger. We’ve removed a critical arrow from the quiver of the crony capitalists: No longer will they be able to claim that the Export-Import Bank is the only thing keeping the small business economy alive. That claim will have been exposed for the lie it is, and next time, ending the Bank for good will be that much easier. So take a minute to forget about the heresies of the Supreme Court and enjoy this small victory. You’ve earned it. O the behalf of the perfect demo for the website and most popular game scrabble word finder words which specially made https://scrabblewordfinder.me for the person or game lover who want the fun and wisdom twist and this type of the combination really make very rich chance for the every person. It is about time that this corrupt, corporate welfare machine was shut down. GE and Boeing have gotten a majority of the money and if it wasn't going to them it went to useless Obama Green Energy buddies or corrupt foreign companies that use it to steal s from the American Workers. Good Riddence! Now who has supported the ex-im bank for it 80 years ? The Democrats ,their majority was broken in 1994 and they retained their majority again Which forced Clinton to changed his economic plans and control spending. Since the elections in 1954, Democrats have controlled Congress until the 1994 elections, where the Republicans dominated until the 2006 elections. From 2006 to 2010 Democrats had control. In 2010 to 2012 Republicans have the house and Democrats have the senate. Here are the totals 12 years for Republicans 40 years for Democrats. 2 years split. On behalf of our over 6.9 million activists nationwide, I urge you to call your senators and representative and ask them to vote NO on the highway bill conference report, which has been renamed the Fixing America’s Surface Transportation (FAST) Act. This bill would not only fund the insolvent Highway Trust Fund without any reforms to prevent future bailouts, it would also reauthorize the expired crony-capitalist feeding trough, the U.S. Export-Import Bank. On behalf of our over 6.9 million activists nationwide, I urge you to call your representative and ask him or her to vote NO on the DRIVE Act, H.R. 22. This bill would not only bail out the insolvent Highway Trust Fund without any reforms to prevent future bailouts, it would also reauthorize the expired crony-capitalist feeding trough, the U.S. Export-Import Bank. Speaking to the liberal Republican Main Street Partnership last week, Speaker John Boehner’s chief of staff, Mike Sommers, named the reauthorization of the Export-Import Bank as one of the main priorities for the House of Representatives in October. Sommers also praised the liberal GOP group, while making a subtle dig at principled conservatives who believe Republicans should govern by the limited government values on which they campaign. Last Friday, 218 Members of the House (including 42 Republicans) made a sudden and uncommon move called a discharge petition to bring a re-authorization of the U.S. Export-Import Bank out of committee without a vote. Although GOP leadership in the Senate have indicated that they are unlikely to pass this specific bill, the tactic demonstrated that the House has the strength to revive the expired corporate welfare bank if the Senate were to reauthorize it in a separate bill. This July, an 80-year-old corporate welfare program known as the U.S. Export-Import Bank was allowed to expire for the first time since its inception. Created by FDR as part of his New Deal, the bank offers taxpayer-backed loan guarantees to companies unable to secure independent financing - in other words, loans too risky for private investors to be willing to finance. Don't Revive the Cronyist Ex-Im Bank!